We usually have a full day, starting at 4:30AM. With traffic, work, and our running schedule often we don’t walk back into the house until after 6:00PM, so for a quick, easy and satisfying meal at least once a week we have breakfast for dinner. Really who doesn’t love breakfast, so why save it for just the mornings? 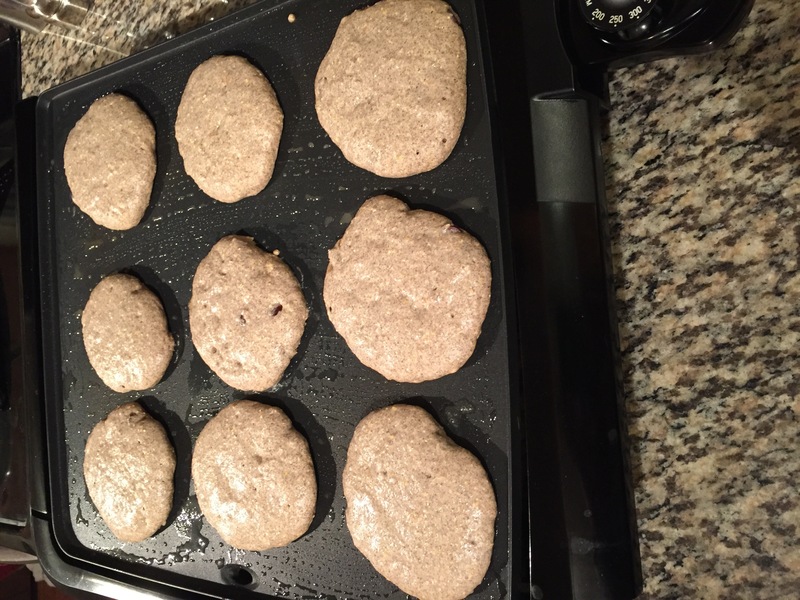 My go to breakfast are these Buckwheat Chocolate Chip Pancakes! Combine all of the dry ingredients and mix well. Then pour in the almond milk and stir to combine. I use an electric griddle set to 350 degrees and grease it lightly with a little bit of Earth Balance Vegan Butter. Spoon the batter onto the griddle, after about two minutes flip and cook another two minutes. This makes between 9 and 11 pancakes depending on the size you like to make. I usually serve it with some Lightlife Smart Bacon and pure Canadian Maple Syrup. I hope you try the recipe and enjoy the pancakes!